MRTFC (Multi-Residential Timber Framed Construction) is a certified fire and sound rated timber construction system conforming with the requirements of the Building Code of Australia (BCA) for multi-residential buildings. 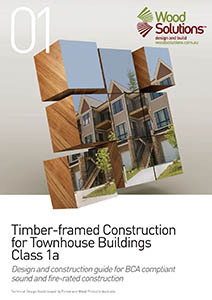 The Timber-framed Construction for Townhouse Buildings Class 1a Design & Construction Guide for BCA compliant sound and fire-rated construction demonstrates compliance with targeted fire safety and sound-insulation performance requirements for Class 1a attached buildings and associated Class 10a buildings. Protection against spread of fire both between dwellings and on external walls (where required). It does not deal with fire detection and early warning in buildings (including smoke alarms), heating appliance issues, bushfires or fire in alpine areas. The guide provides certified construction details by utilising the BCA's Deemed to Satisfy Provisions. In addition, guidance beyond BCA minimum requirements is provided for those wanting to improve and upgrade sound performance. CAD drawings of the relevant figures shown in the design guide. The files are in the following formats - Archicad (mod), AutoCAD (dwg), Jpeg, pdf and rvt. The figures for which there are files are shown below.